Activision have unveiled further details regarding the Nintendo 3DS version of n Skylanders Spyro’s Adventure. Players will assume the role of a powerful ‘Portal Master’ that is able to control over 30 different characters including the beloved fire-breathing dragon, Spyro. You’ll be able to look forward to embarking on a journey to the Radiant Isles where you will explore mysterious islands, battle menacing creatures and collect treasures as you quest to save the Isles from the malicious Hektore. The series of interaction figures are classified by element types – Earth, Air, Fire, Water, Life, Undead, Magic, and Tech – meaning that players will have to play strategically to overcome certain enemies or to discover certain areas within the game. 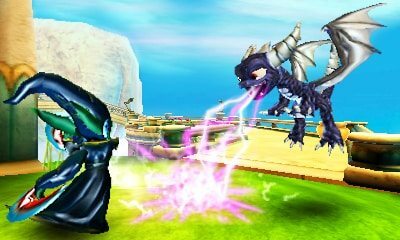 The Nintendo 3DS version will also exclusively feature the ability to bring two characters into the game at any time, providing the opportunity to create over 600 unique tag team match-ups with your favourite interaction figures. Such experiences are also able to be shared, for the first time ever, through cross-platform playability, allowing you to use your same levelled interaction figure across other platforms that Skylanders Spyro’s Adventure is to be released on.